My heart is heavy today as I'm still processing the reality of Pete's passing. I don't recall having had quite this feeling since my dad passed in 2000. Such a mix of emotions, the most prominent of which is profound gratitude at having had the great good fortune to have known and been influenced by this exceptional man. I had admired him from afar while growing up in California, certainly was moved and inspired by his records beginning around 1960-'61. But it was in '97 that we first met and shared the stage when I was invited to NY to concertize on behalf of Seeds of Peace International Camp for Conflict Resolution. More recently, I was the first to purchase a limited edition Martin 'Pete Seeger' Signature 12-string from the esteemed guitar manufacturer. It had been fashioned after Pete's 12-string built by Bruce Taylor after the original instrument made by Liverpudlian luthier Stanley Francis - around 1959, if memory serves. I took it directly to Pete & Toshi's house where Pete pronounced it "beautiful." Truly. When Pete turned 90 in May of 2009, I had just completed my 2-month treatment of chemo & radiation for a back-of-the-tongue carcinoma (now in full remission, I'm happy to report). I'd lost something like 70 pounds for inability to swallow. Pretty weak. Everyone I knew was going to Madison Square Garden for the big celebration, but there was no way I could face such a daunting spasm of humanity. Yet I was determined to honor Pete in some meaningful way. So I baked him an apple pie. I'm kinda well-known for my apple pies among a small circle of friends. Given my weakened state, I was only able to peel one apple at a time before sitting down to rest for a bit. Slowly, surely I made my way through the several varieties that I typically employ, got them mixed with the supporting ingredients and into the oven. I removed the fully baked pie, allowed it to cool a bit, then pointed the car north for the hour-long drive to Beacon NY and stepped on the accelerator. Phoned my pal David Bernz en route and we met and he then accompanied me up the vertical slope to Pete & Toshi's Hudson River-view cabin with the hope to find them home. (I'd opted not to call ahead, choosing the element of surprise instead.) They had just returned from somewhere and greeted us at the door. Still unable to swallow, I couldn't join them but the pie must've been OK as I enjoyed watching Pete and Toshi each gobble down two sizeable pieces. When I casually mentioned that I eschew white sugar in favor of maple syrup to sweeten my pie, Pete jumped up and ran upstairs, returning with a Ball jar of their own maple syrup from the past season. Then he grabbed a guitar from the wall and treated me to a personal rendition of his song 'Maple Syrup Time.' Sooooo much better than Madison Square Garden could ever have been! I would re-Pete the ritual for the next four birthdays. And the unopened jar of syrup sits proudly in the fridge to this day. Farewell and thanks for gracing the planet, Pete, and please give Toshi a loving hug from Madhumita and me. 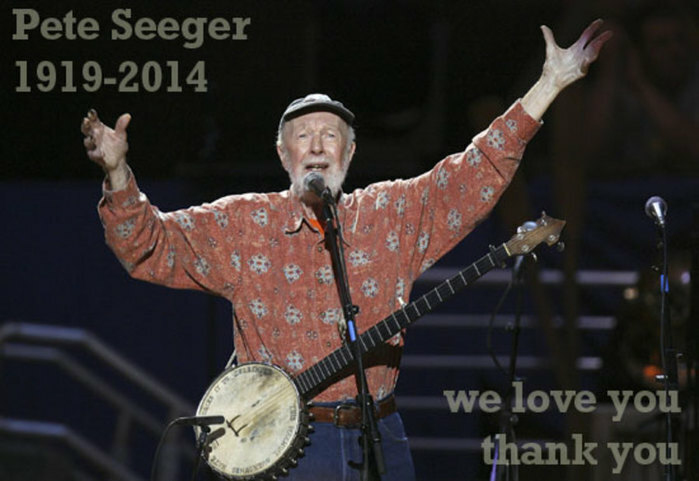 The last time I saw Pete Seeger was when Susan Wright asked Kirkman and I to back up her and Pete at the Spirit of Beacon Day in September, with a group of Susan's students from the Beacon schools. Before the parade and show Pete and Tinya came down and walked around, saying hi to all of the street vendors and folks. At some point Pete had had enough of walking and came over and sat with Steve and I for about 45 minutes, and we shared a bag of popcorn. I've gotten to spend more than my fair share of time with Pete over the past 8 or so years, and much of it has been quality time. Pete was always gracious about people wanting to shake his hand or get their picture with him, but being an introvert and not a fan of celebrity, he never seemed particularly comfortable with it. I think he liked it best when he was able to hang out with people who didn't know who he was, or didn't really care and were able to just be folks. That day last September a lot of people came over and shook his hand, and he had to get up a lot to be in photographs. The amazing thing is that, observing this, I really got the sense that people want to shake his hand not because he is famous, but because of who he is and what he's done. It seemed to me that this time Pete really enjoyed the contact. I don't know if it was being without Toshi, or that he had some idea that this might be his last Spirit of Beacon day, but I'm very grateful to have spent that time with him. I wrote the song Sing Sing Sing directly because of Pete. After watching Pete teach 200 people to sing Take It From Dr King one time, I decided that I could never do that, but maybe I could write a song simple enough for a crummy teacher like me to teach. The second to last time I saw Pete was in August, when Guthrie's Ghost (Steve Kirkman, David Bernz, Jacob Bernz, Amy Fradon, and I) played a benefit for the Sloop Woody Guthrie. Pete sat with my soon- to- be wife Peg, and I watched him sing along every word of Sing Sing Sing, in his seat. (He'd sung it a while back with Beacon school children.) Later in the show he came up and sang a few songs and we backed him up for Hammer Song. That day as he was leaving he caught my eye and gave me a very sweet wave that really melted my heart. It kind of struck me that this giant of a man was also a fragile human being that had just lost his wife of 70 years and was probably overwhelmed by grief. I know it will take a thousand people like me to do a tenth of what Pete did, working as hard as we are able. At the same time my memories of him, because of how I got to know him and spend time with him, will always be just of a human being. Funny, stubborn, intelligent, imaginative, and above all humble. He PRACTICED humility. I met him late in his life, and every time I saw him he actively taught me and all the other folks around him what we would need to know to carry on his life's work. Mostly he taught us that we'd need each other and we'd need to work together to get anything done. I'm extremely grateful to all of the people who, for some reason, put me in Pete's path, over the years. I won't name names because I'll leave someone out. I think most of us will not remember him as the writer of hit songs or the guy with Bruce Springsteen at the President's inauguration, or the guy getting a medal from another President. We'll remember him as the guy sitting in the grass or on the Clearwater deck with a banjo, surrounded by children. We'll remember him carrying a 40 foot ladder or building a stone wall at the Sloop club. We'll remember him eating a bag of jelly beans or popcorn and we'll remember his dry New England sense of humor. I believe he was very proud of the big moments in his life and he cherished them, but he'd want us to remember him with an axe and a maul, or a sign on the side of the road that said "peace." Pete loved children and when I got to put homeless kids from Westchester together with him, he was oh so very happy. Those kids lifted his heart. That makes me very happy. I loved him and his wife Toshi very much and will honor them until the day I die.